REALITY BEGINS HERE AMONGST THE FIZZ OF POETRY AND RIVALRY. Some of my favourite folk songs. Saturday saw the final Poets Trail workshop, where the poets had an opportunity to explore the park on their own and gather their thoughts in their own piece of space. It was a time to focus on the personal experience of the place; the “ME” time as those who think they are trendy call it. Is it still trendy to say trendy? This personal time, where you live in your thoughts and do not have to share anything is important to every writer. Some may lock themselves away in the proverbial garret struggling at their art; others walk the story and live the dialogue. They appear to wander aimlessly so deep in thought that they are considered to be an out of touch with the real world. When all the time they are creating the next real world: the novel, the script, the film and there you go everyone is talking about the new creation. The writer though known and named remains with that subtle anonymity that allows them to walk down the street aimlessly in deep thought creating the next reality. Back to the trail, I am now receiving some wonderful, thoughtful and well crafted poems for consideration and critique, the poets have until the 8th April to submit there poems and I look forward to reviewing them and making the final decisions with the group from Pooley Country Park as to which we will use. Then there are those poems that don’t end up on the trail but are never-the-less worthy poems, that should not be forgotten or lost and for which I will actively seek a means of preserving them and making them accessible to the poetry world. This has been a wonderful experience and I am very honoured to have led this project. It has created a new circle of Polesworth poets, who have engaged with the place and been inspired to write a major new collection of contemporary poetry. But the experience has been far more productive than the poetic works, but it has also developed new friendships, shared ownership and the feeling of playing a real part something quite special. For those who are not suffering from workshop fatigue following my four workshops, here are some others that I can recommend. Jacqui Rowe also has an excellent programme of Making Poetry workshops in Birmingham throughout the Spring and Summer. The Nine Arches Press are currently into their Spring Programme, some of which have already gone, but I am sure they will have future programmes. You can keep informed by following this link. John Siddique is also running a monthly workshop in Hebden Bridge in West Yorkshire, details of which can be found on his website. I am hoping to attend at least one of each from these programmes of workshops. It is my belief that you need to keep pushing boundaries and exploring new ways to approach your writing. If you think you have mastered the art of writing, then it is time to experiment, before you settle into writing the same things in the same style, the world can only take so much; it is time to move on, get fresh, get new, stay out of a pigeon hole. Last week also saw THE FIZZ 6 – when the Lichfield Poets (most of whom do not live in Lichfield, but then who am I to talk, I don’t live in Polesworth) gave excellent readings from their Battlelines Anthology. The event was most excellently reviewed by the Secret Writer in her blog, which you can read by following the link below. The next Fizz – FIZZ 7 will be on 17th May when we will be reading the selected poems from the latest phase of the Poets Trail, along with some of the best of those not chosen. I am hoping that as many of the poets will be there to read their work, but I will make sure that all the poems are read. Look out for the advertising nearer the time. Last Thursday saw me head to Nuneaton for a meeting with Rach Flowers and Alan Ottey to discuss the possibility of holding a day of Summer Poetry in the market place on a Saturday. We have set the date for the 2nd July and are pursuing a range of activities, which includes poets reading though out the day and at an open mic. event in the early evening. There is still a fair amount of work to organise this and to finalise the details, but if there are any poets out there who fancy doing 10 or 15 minutes reading in the market place and can get to Nuneaton on the 2nd July then please let me know. As the details unfold I will add them to this blog. Finally, it seems that there is a rivalry developing between the Shakespeare centric South Warwickshire and the George Eliot focussed North Warwickshire. Whilst I don’t want to get into the middle of this rivalry, for as far as I am concerned they are all worthy Warwickshire Writers. However, I am often approached for my thoughts on North Warwickshire’s role in literature. So as an a-side and this list is by no means complete. In addition to George Eliot, I think the following writers have all been influenced by North Warwickshire, either through living and writing here or through visiting and bringing North Warwickshire into their work. Michael Drayton, John Donne, Ben Jonson, Francis Holyoake, Raphael Hollinshed, Sir Henry Goodere, Sir Aston Cockayne, Henry Francis Cary, Thomas Warton, Sir Francis Willughby, Sir William Dugdale, Jane Austen, Edward Farmer, Siegfried Sassoon, Edith Holden, A.J Quinell, Caroline Graham. I have not included in the list writers from Coventry or Birmingham who in their day would have been thought of as living in Warwickshire – but when the borders change and new counties emerged it makes these rivalries meaningless. I say, Read and Celebrate them all. Details of my reading in April will be posted in my next blog, which will be late next week but if you check in then you will find out why. THE ART OF LISTENING: THE OAKS AND SINGING PIT PROPS. The talk given by the ex-coal miners at the poets trail workshop. Man from another time – Seasick Steve. Saturday saw the third of the Poets Trail workshops, where eighteen poets gathered at Pooley Country Park in the reflective spring sunshine to discover the further delights of this enigmatic place. The day started with another walk into the park to look at some of the Oaks which form a line along side a ditch which is seen as a boundary. A boundary between the coal and the arable – these Oaks are about a hundred years old and would have spent their first sixty or so years on the edge of the pit top. One in pure gothic splendour has its branches twisted and curled as if it did not want to spread these branches to command a glorious regality of a Royal Oak, but wanted to pull them in like a mother wrapping her arms around her children, pulling them in to stand protected at her feet. This oak now has its own splendour, a remnant of its past, the children now all grown and fled, it stands in arthritic pose, you can almost hear the sighs as it tries to stretch. This was sculpted out of a sea of ash and spoil, its first breaths fighting against a polluted air and dust. It marked the boundary between the pit hell and the lost country. The lost country now prevails and the oak stands as memory that it was not always that way. We were joined in the afternoon by four ex-coal miners, who talked of their experiences in the pit. There was a special comradeship between the miners, one that was superior to that of any other working environment. Most of them had worked the mines and then worked in factories and despite the heat and damp, the dark and danger; they much preferred the comradeship of the colliery. Their skills and knowledge was honed over centuries passed on from one pitman to another, such as their preference for wooden pit props known as trees to the modern metal props, because the wood creaked when it took the weight and from the sound they could tell if the roof was likely to collapse. Their ears tuned to splintered song, creak beats and whistled silences that moved the earth and in its wake brought a tallied fear, it wrapped them up in comradeship, each looking out for the other, each knowing without saying, each glad of the presence, where there were no “eaches” only a whole. Their daily march to the pit head, then down in the cage to the pit bottom, the ride to the end of the line and then a further two mile walk to the face, then crouched and bent double they did their stint eking out the coal, breathing in the dust, lying in leaching water, this was coal and comradeship. As we sat by our crackle firesides watching the flame-birds dance, as the machines forged and stamped out our luxuries, did we ever really appreciate it? Gary Carr’s excellent Spoken Worlds on Friday had a great crowd and I would like to thank Gary Longden for his kind review at Behind the Arras. Sunday saw me heading to Nottingham to the Shindig at the Jam Café. Shindig is a monthly poetry event run by the Nine Arches Press, sometimes in Nottingham and others in Leicester. Its readers drawn from the very best of the East Midlands Poetry scene. It, however, ended up being a wasted journey for me. I found the street but it was heaving with cars and I was forced to find somewhere else to park, which is when my problems started. The traffic system took me away from the area and I ended up touring the district of Sneinton, which for fans of the films of Shane Meadows, could be a delight, although Robert Carlisle was no longer walking the streets that made up Once Upon a Time in the Midlands. By the time I had made my way back into town and found my way to somewhere I knew, I was on the A52 heading back toward the M1 – by this time Shindig was 40 minutes into the event, so I gave up and went home. Which was a pity as I was hoping to have a chat with the Leicester poet Mark Goodwin, who is promoting his Sound Cloud site Air-to-Hear, and is looking for poets to submit Digitally Produced Audio Poetry (DPAP)? This is not reading poetry to music; it allows poets to explore the use of sound and to give validity to all sound, not just the pleasant to the ear. Rhythms are everywhere but we sometimes filter them out looking for the pleasant pitches that sooth. This led me to think more about the sound tracks for the films and the need to develop a different approach. The sound track for Yell! was developed after the images, the music produced by Jimi at Hydranoid Musia was excellent, it reflected well the images and changed the mood as it was adapted to fit the film. My vocal reading of the poem, however was poor, it was rushed and I think this showed. The approaches that are used in Mark Goodwin’s sound cloud site stand in their own right as pieces that take spoken word into the next carefully considered place. This in my opinion does not devalue the artistry of poetry, which the pop song did to song writing. It enhances the poetic experience as it asks the listener to consider the poem in differing soundscapes, pushing forward the sometimes awkward, jilted sounds. To filter in some of the pitches that we think will jar and annoy and to let them change our mood and explore our true relationship with them. This is the approach that I will use with Jimi to develop our future sound tracks, storyboards and sound boards with the script of poetry. You can hear the tracks on Mark’s sound cloud; I particularly like Mushroom and Court Case from what I have heard so far, check it out on the link below. I also have my own Sound Cloud – The Soughing Wind where I will post our experiments in sound – I will discuss them further in future blogs. It is the Fizz this week with the wonderful Lichfield poets my final reading of the month, look out for my future readings in April and for details for my trip to read in Cork and Limerick in August. I will be reading at the following events during March. The Fizz – 22nd March – Polesworth Abbey – Polesworth. THE SILVER BIRCH THAT GROWS AMONGST THE ASHES. Joining Facebook groups that email you with every piece of trivia that is posted on the wall and not having the time to sort out how I stop this happening. Seeing the different stages regeneration of an industrial landscape back to nature all represented in a 30 yard piece of ground. Saturday saw the second of the Poets Trail workshops. Twenty one poets came along to explore the landscape at Pooley Country Park and to talk to the naturalists and the Polesworth Society on the themes of that are the subjects of the poems. The morning started with a brief tour of the Pooley Country Park site, where Adrian Wallbank who is one of the rangers took the group across the site pointing out how it had developed from a Colliery into a country park. This has been in the main a natural regeneration with only management from the park rangers. With the recent earthquakes in New Zealand and last week in Japan, for which my thoughts are with the people of both of these countries as they come to terms with the natural disasters and the most terrible destruction of their communities and the loss of so many lives. All innocent victims of the power of nature. I cannot help but reflect on this power of nature and its ability to self preserve the planet no matter what human endeavour throws at it. This was brought home to me on the miner’s path at Pooley, where within a 30 yard spot you could see the phases of regeneration. Closest to the path at the base of spoil heap was the barren almost lunarscape remains of the extraction of the coal deposits. Grey and black shingled stone and dust that lies, hard and broken, cold and bleak, ripped out of the ground as the smashed relics of millions of years lying compressed under ground. The leaf fossils amongst them can breathe again like the leaves that formed them, be it a polluted air, a nuclear air, a post industrial air, unlike the purity that leaves once knew. Or is this air purer than the sulphur bound pre ice-age air that once surrounded this land as the earth formed and the tectonic plates moved England from the equator to the northerly position where it now floats? About 8 yards in from the path, a covering of moss begins, grasping roots into any dust that will hold them, covering the grey slag which lies millimetres beneath, it ripples over the uneven ground like a surface tension on rippling pool, its delicate pattern easily broken, a footprint tearing it away, a breeze lifting it, the moss roots pulling down to hold it as its precarious existence struggles to remain and to tip the balance in Natures favour. After a further 10 or so yards the moss bond is strongest and Silver Birch trees grow, the primary colonisers that grow from catkins on groups of island coppices that sit in the moss lake. Here the balance has been firmly tipped, with the Silver Birch leaves each year falling to the ground to create a fertilized mulch that becomes the top soil from which ferns and grasses take root. Here is the delicate balance between man and nature, where man has taken him self out of nature into thinking that we are the only ones who understand the life forces and can manage and control our natural environment. This is a gentle battle zone where borders are defined and redefined, where nature like poets, quietly says – you are not listening, you don’t understand. But, there is a harmony here, an understanding and sense of not interfering. The power of nature is here to see, to wonder about, its enchantment not to be ignored, the wind whispers of it, the water ripples, the reeds warble. It is now the poets muse. Following the walk we had a couple of talks – Richard Meredith and Brian Mitchell talked about the Nature Reserves and Sue Collins brought along the characters who have shaped and some still haunt Pooley Hall. Next Saturday we will be exploring more – with talks from a group of ex-miners and from the Rangers. Some of the poets have started to send me draft ideas on the way they may tackle the themes. There is a real passion for the project, from some highly motivated poets, this is absolutely wonderful for me and I hope that the poets on the second phase take away some ownership of their part in the project and reflect on the experience long after it is completed. I also hope that the visitors to Pooley will see the place in a new light, see that it represents the microcosm of our delicate earth. I must mention the readings this week as I will be reading on every other day starting on Wednesday. Wednesday the venue for the St Patrick’s Day festivities in Coventry has changed and will now be at the Squirrel Pub in the centre of Coventry – This is being organised and promoted by the Coventry Irish Society and will also feature along with myself, Tony Owen, Barry Patterson and Bethany Norris. Gary Carr’s excellent Spoken Worlds is on Friday for the final time at Rangemore House as he will be moving to a new location and possibly a different night of the week from April – more details will no doubt be given on Friday. Always a good night. 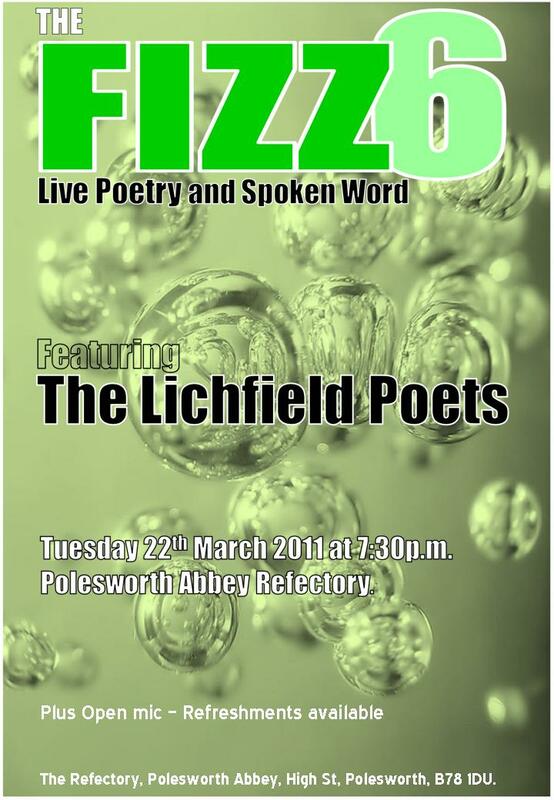 My Fizz evening is on Tuesday 22nd at Polesworth Abbey when the guests will be the Lichfield Poets. I hope to see many of you there. St Patrick’s Day Festivities – 16th March – The Squirrel Pub – Coventry. Spoken Worlds – 18th March – Rangemore House – Burton-on-Trent. Shindig – 20th March – The Jam Café – Nottingham. NEIL, BUZZ AND THE WOLF SPIDERS FROM THE MOON. There is still FROST in the morning! This last week has been a mix of a reading, writers groups and questions. Answering the questions forming the main part of my activity, as the poets who are attending the Poets Trail workshops are fired up with ideas that they want to research and are firing emails at me for guidance on all sorts of subjects from Wolf Spiders, to brickworks, coal mining. I have had two people who have sent examples of excellent poetry to see if it their thoughts are heading in the right direction. I think all of this activity is wonderful and it is great to see the shared passion for the project is equal to mine. I am looking forward to the next workshop on Saturday. I have also received a lot of kind comments from the participants on the first workshop, who appreciated the structure and content and found it motivating them to explore new ideas. So my concerns on my previous blog as to whether the balance was right was unfounded and I can now focus on making sure the rest of the workshops are inspiring and fun. The first workshop was very much a classroom based workshop, the rest will be out in the field, experiencing the place and enticing some communication with the genius loci. The fifty minute piece of music, THE BIG 5-0, that has been created by my son Jimi as his gift for my 50th birthday is completed and I am proudly listening to it on the car stereo as I drive from workshop to gig to writing group. The piece consists of five ten minutes sections each representing a decade of my life, the themes have been drawn from events, objects and activities that have been important to me and which Jimi has picked as being part of the memories that I have passed on to him. The first section Swooping Eagle, takes as its theme the moon landing of Apollo 11 in 1969. Jimi fondly remembers the thoughts I had about the event, how it captured my imagination as 9 year old that saw me devouring any newspaper reports, TV and radio news. The music has a mix of soft ambient sounds that reflect what we would imaging the peacefulness of space along with driving rhythms that define the movement of the spacecraft. Mixed over this is the actual communications between Houston and Neil Armstrong and Buzz Aldrian as they guide the Eagle landing craft down on to the surface of the moon at Tranquillity Base. The next section is a comic based piece entitled TV was a little fuzzy in the 70’s and uses extracts from Monty Python, Carry on films amongst others to provide a montage of the best known lines from these examples of the 1970’s film and television. Jimi has further added to the comedy by mixing them up and editing them to create a new comic rendition. The third section has a very 80’s feel with its synthesised sounds and drum beats – it is entitled Gotta get a Filofax. This is the first period of my life that Jimi was part of so the ideas come from his actual memories rather than what I have passed on to him as one of my memories. This was the last of the tracks to be completed and you can see the development of his skills in putting this and the last two pieces together. He has a clearer understanding and is prepared to push his new skills further. The fourth piece is called Gedcom Knights and reflects my interest in Genealogy that I actively pursued with my brother Gordon in the 1990’s. – It starts with an Elizabethan sounding guitar which reflects that we managed to trace our Dewhirst ancestors back to 1572. Jimi adds in drum beats that at times are very tribal, English tribal, again linking in with the theme. There are several sections that provide the sound of a tree growing as if it grew from a seedling to be full grown branched and leafed in two minutes. This is topped of with a poem that he has written, which takes in aspects of our name and how it has been represented. It is an excellent poem and shows that he also has the potential as a wordsmith. The final piece is entitled Paper Prisons and is driven completely by drum beats, that reflect the monotony of having to do a day job, whilst wanting to pursue other more creative vocations such as writing and film making. From the age of seven I have wanted to be a writer and it wasn’t until I turned forty that I actively pursued writing as major part of my life. This is an absolutely wonderful eclectic collection of sound vistas that hold rhythms and words that reflect my life so far. This is by far the greatest present he could have given me, using his talents, he has researched the themes and then spent countless hours interpreting them into a sound track that I am truly honoured to receive. There will only ever be two copies of this wonderful piece, so to get a feel for what Jimi has achieved follow his future work on the films we will be making this summer. In the meantime listen to his earlier work on my film Yell! Follow the link, start the film running, close your eyes and just listen. World Book Night saw Rach Flowers and Rach Gee handing out books in Nuneaton Market as previously mentioned in my blog. The two Rach’s had a great deal of fun and following a radio interview on BBC Coventry and Warwick had book receivers heading into town to specifically to pick up a copy of Seamus Heaney’s poems. The success of this event has fired up the imaginations of the Market management team and Waterstones to maybe hold another poetry day in Nuneaton in the summer, if anything develops on this I will let you know through this blog. 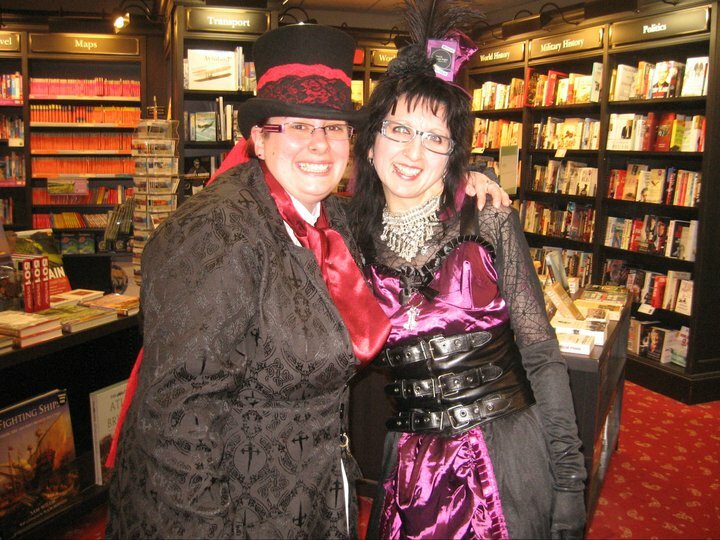 In the meantime here is a photo of the two Rach’s dressed to give away books. St Patrick’s Day Festivities – 16th March – Inspire Bar – Coventry.